Purpose: To show how three people remained strong in character and true to God even when the society around them was collapsing. Author: Unknown. Some think it was Samuel , but internal evidence suggests that it was written after Samuel's death. New Geneva study Bible. 1997, c1995 (electronic ed.) (Rt 2.3). Nashville: Thomas Nelson. Word in life study Bible . 1997, c1996 (electronic ed.) (Rt 1.2). Nashville: Thomas Nelson. Home: Born in Moab, but relocated with her mother-in-law Naomi (see Ruth 1:2) to Bethlehem in Judah after the death of her husband. Family: Was the wife and widow of Mahlon (Ruth 4:10); remarried Boaz by an extension of levirate marriage; gave birth to a son, Obed, who figuratively was called the son of Naomi (4:13–17); was an ancestor of David and Jesus Christ (Matt. 1:5, 16). Occupation: Originally a homemaker, later a maidservant of Boaz (Ruth 3:9), and finally a homemaker again. Best known today for: Insisting that her mother-in-law Naomi allow her to come to Bethlehem, in order that Naomi’s people, the Israelites, could become Ruth’s people, and Naomi’s God Ruth’s God (1:16–17). When we first meet Ruth, she is a destitute widow. We follow her as she joins God's people, gleans in the grainfields, and risks her honor at the threshing floor of Boaz, in the end, we see Ruth becoming the wife of Boaz. What a picture of how we come to faith in Christ. We begin with no hope and are rebellious aliens with no part in the kingdom of God. Then as we risk everything by putting our faith in Christ, God saves us, forgives us, rebuilds our lives, and gives us blessing that will last through eternity. 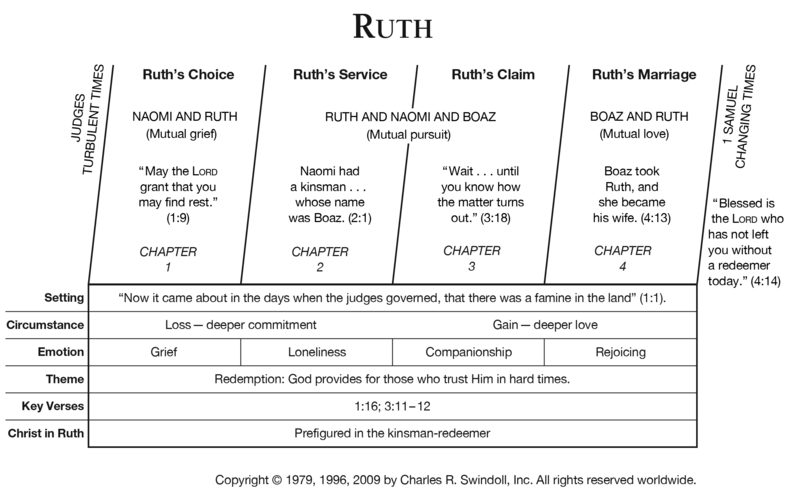 Boaz's redeeming of Ruth is a picture of Christ redeeming us.